Wuhu detailed information: your wants regarding your stay, some instructions about tours and convenient solutions for hotels and rooms arrangement. Hotels: Wuhu and China reservation service, discount accommodation at budget prices. Tours: you can informe about Wuhu travel to discover the principal highlights and to visit the famous attractions in the surroundings. 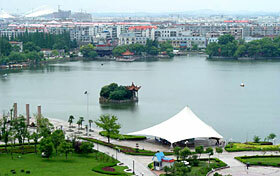 Wuhu is close to the Changjiang River, QingYi river, another name's Jiujiang river. It front of a garment river take the river, hills are green and waters are clear, picturesque, as far back as ancient times, are known as " the huge port of the Changjiang River, the nucleus of Anhui ", praised as the first of four rice market of China in history. Now, Wuhu is not only the famous ancient city of the South, but also hubs of communications of land and water and internal and external trade ports in Anhui, the important door of the south tourist zone of Anhui, is important industrial city and the centre of the economic belt of the Changjiang River of Anhui Province, it is one of " stars " in the national medium-sized city. 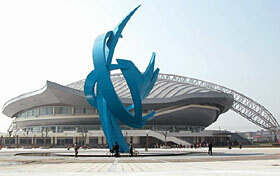 Located in the intersection of Qingyi river, dChangjiang river, YunCao river. The area is 203 sq. km.. Give a recommendation travel scenic spot as follows, small sharp mountain stone forest, three piles of waterfalls, the day stone of the temple of toad , the mountain majestic appearance of stone, eight exhortation stones, bat's peak, three piles of waterfalls, one pair of dragons lake, help temple , the pavilion , green bright garden on easy day in document , Dai AnLan martyr's tomb, Wuhu Confucius Temple, play with the spring scenery of the whip and so on.